An Overview: The Communication Lab (COMMLAB) is a required part of Communication 1103: Interpersonal Communication, Communication 1105: Public Communication, and Communication 2175: Issues in Media Studies. The purpose of the experiential learning lab is to reinforce what the students are learning in class and to help them reach their cognitive, affective and behavioural goals. 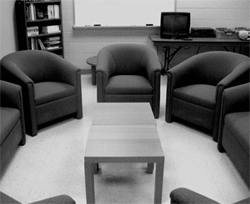 Through small group discussion, role-playing, and video-taped activities, the lab complements the class, but is a unique experience for the students. Students have stated that attending the lab is a major contributor to their success in the class. The lab is designed to be a comfortable, relaxing environment that is conducive to discussion and participation. For more detailed information about the lab, please refer to the Communication Lab Component. A Brief History: The Communication Lab was started by Dr. Mary A. Lynch in 1965, making CBU's Lab the longest running of its kind in North America. It started off, modestly enough, in a cleared out "broom closet" at "Little X." Dr. Lynch's students wanted a place where they could practice their speeches without her being present. Over the next 40+ years, we have seen much growth and development surrounding the experiential learning lab. In 1967, Mary moved her students from this "broom closet" and began to operate a Speech Communication Lab on the second floor of MacLeod House on the Xavier College Campus. In 1972, the lab was moved into larger quarters at the corner of George and Ferry Streets. This was the first year that Mary used student helpers (known today as Communication Lab Peer Facilitators). When we moved to the current University campus in 1979, Mary was extremely proud to have a new, state of the art space designed to meet the needs of her Speech Communication students. In September 2001, the lab once again moved and it was unveiled as the "Dr. Mary A. Lynch Communication Lab" in homage to its founder. In 2011, the Communication Department created a new award to honour a Communication Lab Peer Facilitator in memory of Pearl Peers. 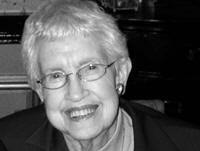 Pearl Peers was the first Communication Lab Coordinator during the pivotal years of 1979 to 1993. The growth and development of the Communication Department at that time required an individual to organize the labs and coordinate the increasing number of Peer Facilitators. She made a significant contribution to the Communication Department by supervising the first group of Communication Lab Peer Facilitators and shaping the lab model into much same the way it runs today. Pearl’s dedication to the Communication Lab will be forever recognized with this award.